The Geo Trade Blog: 中国China - 缅甸Myanmar, a new route to the sea? 中国China - 缅甸Myanmar, a new route to the sea? China's geography is such that sea routes between Asia and Europe are currently limited to starting in the China Sea. Commercial trade ships then navigate South from China's ports to travel through the Malacca Straits bordered by the Malay peninsula with Singapore at the tip, to gain access to the Indian Ocean and on to Europe. 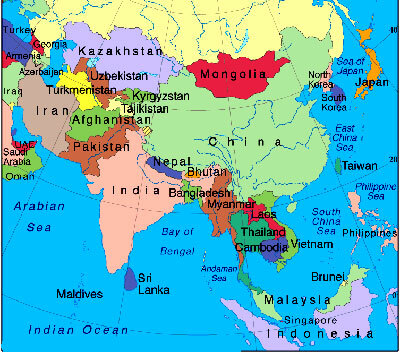 The above map illustrates that China's land mass extends well into Eurasia bordering India and several of the Central Asian Republics like Kazakhastan and Kyrgyzstan. Yet China is hemmed in along its southern border by a plethora of countries including Pakistan, India and Myanmar. In purely Geo-Trade terms, Myanmar represents the shortest distance to the sea from the Chinese border with the added advantage that it is also located fairly close to to the east of China where most of China's industrial hubs are located. Myanmar is not a small country, it covers an area bigger than France and it has a population of around 60m people. It's most recent history is characterized firstly by a military dictatorship under General Ne Win who seized power in 1962 and erected a virtual wall around the country, sealing it off from almost all outside influence for several decades. In 1988, he was suceeded by a Junta after nationwide protests. The Junta has since maintained the country almost as isolated as the General despite some attempts to open the country up. China's dream of having access to the Indian Ocean, it seems is about to come true. China and Myanmar have been working together on building a new port, oil and gas pipelines, and roads which are already under construction in Myanmar, giving China, for the first time direct access to the Bay of Bengal, and a new route for an estimated 20pc of its oil imports. Dams are also springing up on Myanmar's rivers to generate hydropower to provide power to the 云南Yunnan province, in the South of China too. China has at last found a solution to the trade bottleneck through the Malacca straits and at the same time has resolved a key Geo-Trade challenge, by opening up access to the Indian Ocean on its Southern flank, through a newly formed strategic alliance with Myanmar, uniting both their futures, inextricably together.